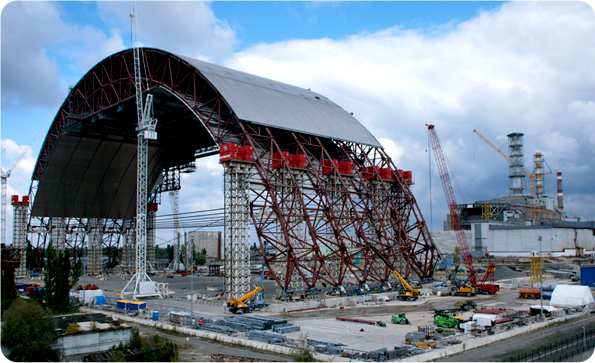 TMC is supporting the construction management effort for the Chernobyl New Safe Confinement (NSC) structure. With 120 local employees on site, we are ensuring that the site of one of the worst nuclear disasters in history is secured and poses no addition threat for generations to come. TMC Ukrainian nuclear engineers and other technical experts provide first‐hand technical and local national regulatory knowledge of the Chernobyl facility at every stage of the implementation, including the New Safe Confinement Conceptual Design phase. TMC ensures compliance with all Ukrainian national labor regulations, including the stringent and specialized requirements of the Exclusion Zone around Chernobyl. TMC provides recurring specialized safety and health training that is required for all personnel working on the project and ensures general regulatory compliance by staying abreast of all licensing and certification requirements. As part of our work on the Chernobyl New Safe Confinement structure, TMC has helped to build and continues to maintain the IT system that supports the project. Our team stood up the IT systems at the onset of the project and has maintained them throughout the project with full life cycle management solutions. TMC’s Network support team keeps the Chernobyl Safe Confinement Program connected to the world even in its remote location. Read The New York Times account of the complexity of the Chernobyl Containment project. This article highlights our work and our team.